A young man comes to New York, dreaming of success and wealth. 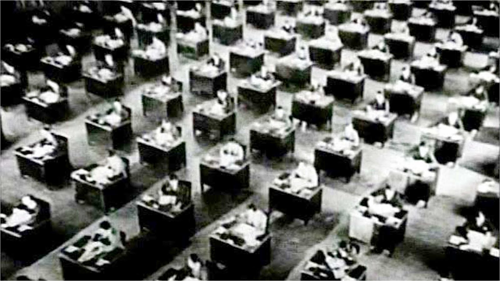 But reality refuses to live up to his dreams–perhaps because he dreams too much– in King Vidor’s 1928 masterpiece, The Crowd. Told with daring photography, real locations, surreal sets, and subtle pantomime, The Crowd brings you through dizzying joy and wrenching tragedy as it follows the story of an ordinary man who refuses to accept that he’s ordinary. Even those who love silent film will often acknowledge that when it comes to character-driven, realistic, contemporary drama, talkies have a distinct advantage. But The Crowd makes one very special exception. Here we have reality–or something very close to it–without the aid of the human voice. The Crowd is not a lost film, but it’s a difficult one to see. Warner Brothers, which owns this MGM title, has never released The Crowd on DVD or Blu-ray. If you want your own legal copy, you have to find an out-of-print, expensive laserdisc or VHS cassette. It’s currently streaming on Warner Archive Instant, but individual titles don’t stay up on that service for more than a few weeks. As far as I know, it’s not streaming anywhere else–at least not legally. The Crowd follows the optimistic but ultimately disappointing life of John Sims, who comes to New York as a young man to make it big. The first time we see the adult John (James Murray in what I believe was his only starring role), he’s on a ferry to Manhattan, smiling and ready to conquer the world. He tells a fellow passenger (in an intertitle, of course) that he only wants an “opportunity.” The look on the other man’s face is priceless. A reverse shot shows us the Manhattan docks, which leads to a montage of New York City, including a couple of shots where the camera tilts up to reveal the high skyscrapers. Then the camera moves up one of those skyscrapers, and heads inside, where rows and rows of desks fill a vast room (yes, The Crowd influenced The Apartment). Finally, the camera finds John, now earning his living. But he’s just one toiler out of hundreds, eagerly waiting for the 5:00 bell that will let him leave the office. That image of the vast, dehumanizing room reoccurs much later in the film, in a surprising context. John has just become a father, and the vast maternity room stretches out with rows of beds. People are born to be lowly workers dreaming of an unattainable better life. Director King Vidor (who also co-write the screenplay) condemns American society in The Crowd, but he also condemns John, a man whose imagination is greater than his real ambitions. He talks about his ship coming in, but he never seems to seriously guide it into a harbor. He works just hard enough to keep his job, refuses to socialize with his bosses, quits in a moment of anger, and rejects a job offer that feels like charity. And all this from a man with mouths to feed. Murray gives an excellent performance here, but Eleanor Boardman gives a better one–one of silent cinema’s greatest acting jobs–as his long-suffering wife, Mary. We first meet her as a flirtatious but innocent young woman on a Coney Island date. On her wedding night (on a train to Niagara Falls), she is shy and scared. In a later breakfast scene, her frustration, exhaustion, and disappointment are palpable. She loves John, and you can see that even when she’s mad at him. And he gives her plenty of reasons to be mad at him. Boardman married Vidor two years before they made The Crowd. Three years later they divorced. I can’t help wondering if a real troubled marriage helped her understand her character. The Crowd is a serious film, but it has moments of joy and laughter. The ending is ambiguous. It’s a happy ending, in that John and Mary are happy when we last see them. But the basic problems are still there. Vidor gives you no reason to believe that the happiness will last. I first saw The Crowd at a Los Angeles museum screening in 1973. It was some 30 years before I could see it again, on Turner Classic Movies. A year or so later, I saw it at the PFA. Last night, almost a decade after that screening, I got to watch it on Warner Archive Instant. Outside of the current, temporary situation, it’s not an easy film to see. But it’s one that should be seen. Warners should give it a thorough restoration (the streaming version shows serious nitrate degradation in some shots), and make it readily available to theaters on DCP and 35mm. And then they should make it available on DVD and Blu-ray, complete with commentary and extras . And if Warners won’t do it, they should license the film to Criterion, or the Film Foundation, or UCLA, or someone else who doesn’t have to worry about stockholders. Six years after making The Crowd, Vidor made a sequel of sorts, Our Daily Bread. It’s an interesting picture, but far from a great one. If I was to put The Crowd on a double bill with anything, I would bill it with Preston Sturges’ Christmas in July. Yes, one’s a drama, and the other a comedy. Yet they have some interesting themes running through both. But for now, just catch The Crowd while you can. The film has not been released on DVD yet as they feel it needs a restoration, which it will at some point but for now, fans can watch the film on WAI. Also, the article makes it sound as if the film is only on the short for a short period of time. It’s not. Films do come off and new ones will come up but it’s not as if they are only up for a few weeks before coming down. Also, there is a column on the site noting which films are coming off so fans have notification of this ahead of time at http://instant.warnerarchive.com/browse.html#CF_2461-3426.